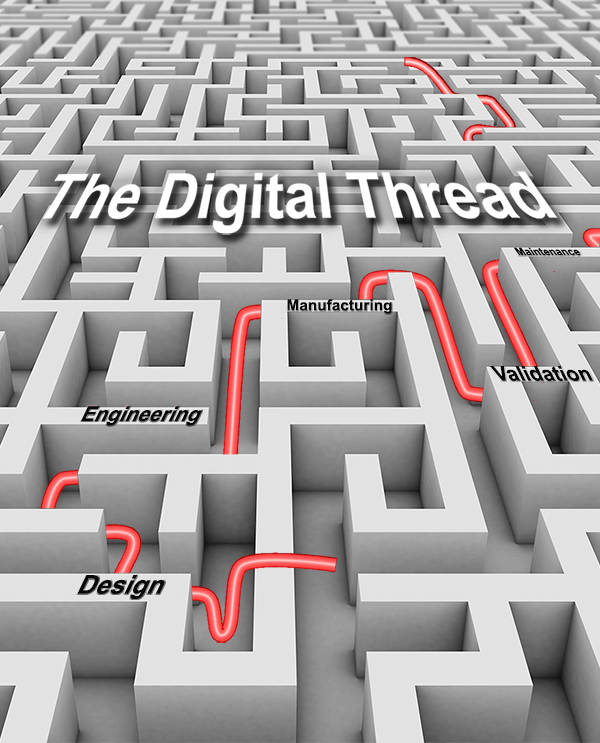 The term ‘Digital Thread’ refers to a data and communications framework that passes through all relevant aspects of design, manufacturing, maintenance and disposal processes, providing an integrated and holistic view of assets throughout a product lifecycle. Without a Digital Thread of product definition, manufactured parts might be designed with one set of datums and intents, manufactured using another set of datums and measurements, validated and checked using perhaps entirely new datums and criteria, and maintained with yet another set of systems and criteria. These criteria mismatches constitute a gap through which critical errors and wasted resources can pass. By carefully using and maintaining the right criteria from the beginning of the design phase, and maintaining that criteria throughout the manufacturing life cycle, errors can be avoided and costs can be reduced. When the entire process of designing, engineering, manufacturing, validating, testing and maintaining products is considered as a whole, meaningful data is extracted, possibilities for design and process optimization become apparent, and more informed decisions can be made. TransMagic COMMAND is an enterprise tool that automates department-wide file translation processes instantly or as often as desired; users can translate to multiple formats simultaneously, accessing optimal read and write settings for each format and outputting any specified XML data to designated network locations without need for user interaction, thereby facilitating digital thread initiatives. You can learn more about COMMAND here. If you’re new to TransMagic, you can try the free trial of TransMagic SuperView here; if you would like to evaluate TransMagic Expert or COMMAND, please contact our sales department at sales@TransMagic.com.